After journaling for decades, I recently hit a plateau and could not get the pen to move on the paper as fast as I used to. After a few months of touch and go, I decided it was time to take a closer look at my journaling habits and perhaps incorporate a few changes here and there. To do that, I thought of going through all my journals – those that I hadn’t burned. I had burned many journals simply because I felt they had served their purpose. The remaining ones were written during the past eight years. I hadn’t decided what to do with them – it’s not yet their time to get burned, apparently. The notebooks had been stored in a cabinet in my room and it’s been a few years since I’ve looked at them closely. It was surprising to see that through the years I had written on spiral notebooks in different colors but all of the same size. I had forgotten about these notebooks, but upon seeing them again, I remembered that I had carried them in small bags that I used one time or another. These 12 centimeters by 17 centimeters notebooks of different thickness were easy to carry around – and I did carry them in my bag wherever I went. The covers have a few scratches or folds but overall, the notebooks were able to withstand constant handling quite well. I am currently writing on a 15 centimeter by 31 centimeter perfect bound notebook – one of two that were given to me as gifts. I had always preferred spiral notebooks because they lie flat no matter what page you turn to. These two perfect-bound notebooks were easy to write on, although they don’t open as flat as spiral notebooks do. One of the things that journal writers should consider in choosing their journals is how easy it is to write on them. 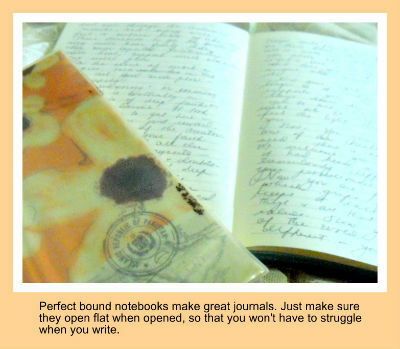 If you have a notebook that is tightly bound, it would be difficult to write on. One of the two notebooks is covered in plastic, so it has also withstood constant handling. But the one I am now writing on, which has a faux leather cover, is already showing signs of wear and tear – and I am only half way through it. I don’t know how much the psychology factor kicks in, but I have decided to put this one to bed because just looking at it already makes me feel lazy to write. Many writers don’t care much for the exterior of their journals, but I think it must have some effect on the journal writer. This is probably why producers of notebooks and journals are regularly upgrading the look of their products. I am now searching for the right journal to carry with me. I don’t want to go back to the spiral, lined notebooks of yore. The choice of my new journal will depend on how I want to proceed with my journaling habit. I agreem Michelle. Portability should always be a consideration when we choose a journal. Yes! And notebooks are a big thing for writers! 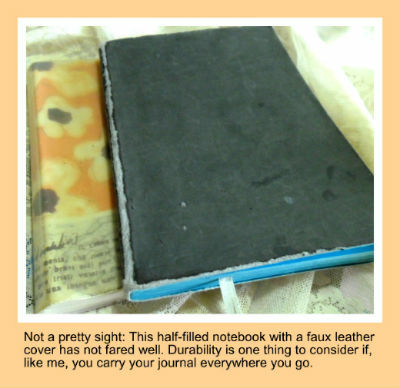 A journal with waxy paper – haven’t come across one yet…none of that around here in the tropics. Happy journaling! I use Levenger products – specifically the Circa system. (www.levenger.com) Paper supplies come in all shapes and sizes. It’s pricey – but worth it for me because it means the difference between writing – or not. Who would’ve thought the materials would make such a difference? Pens and paper – the tools of our craft. Worth a little extra. Oooh, Melissa, yes, they’re pricey! And we don’t have them in our stores here in the Philippines. I’m glad though that you found the right one for you. Yes, pen and paper are tools of our craft – important ones and they are worth a little extra pennies and consideration. I’m in India so usually have to use what I can get. 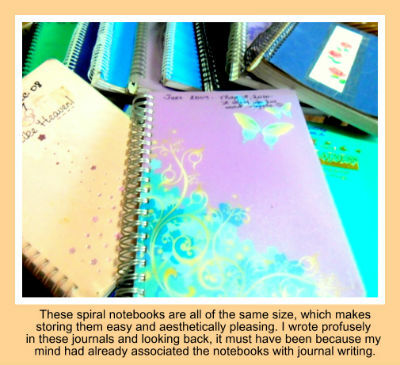 I love the spiral notebooks too but can’t find them where I am. I make do for now. I also write letters for non-computer friends and I always make sure the pen I’m using has ink that doesn’t run when it gets damp. I really enjoyed your blog. So true! And another issue – friends who buy you journals because you’re a writer. And they aren’t all appropriate for my needs. So some I end up gifting to kids or thrift stores. Well meaning people do want to push us onwards with our journaling habits. Fortunately, I’ve received only very few.